At the 3 minute mark we say we’re at both 9 and 16 minutes into the recording. Well seasoned, confusing introductions: Dave, Dave, not Dave and fourth man. Duffers emit sounds, and can identify them in just several hundred guesses. Scottish independence, with reference to mcnalu’s blog post. We range through topics of nationalism, currency, Europe and British vs English/Scottish/Welsh/Irish. Music interlude with a lady singing rather well. Part IV – Boris the buffoon? 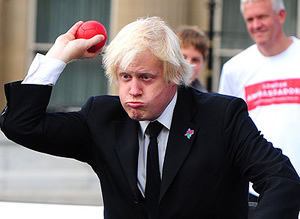 We move onto the next topic of Boris Johnson, London mayor, but then instantly return to Scottish independence, though in time we get back to Boris and his bid to escape being mayor of London to become an MP with a view to leading the Conservative party (it’s like Puss in Boots backwards). The Prime Minister Questions pantomine. Media filling time with pointless questions and reporters reporting from pointless places. Why do TV shows have it in for this country? Why can’t they form a government. Guess this whisky? Finding Scottish music released under free culture licenses is not easy. Mcnalu realises he’s not making sense. We introduce ourselves and Dave is going on an exciting trip, but then returning to grotty, rainy Britain. Send in your funny sounds and pictures of Belgians, and sample whisky!